As the local Wake Forest area grows and expands, concern has been growing over the airport capacity of the Raleigh Durham Airport (RDU). Some feel RDU is ill prepared to be able to handle the influx of demand with all the building going on in the Wake Forest area. 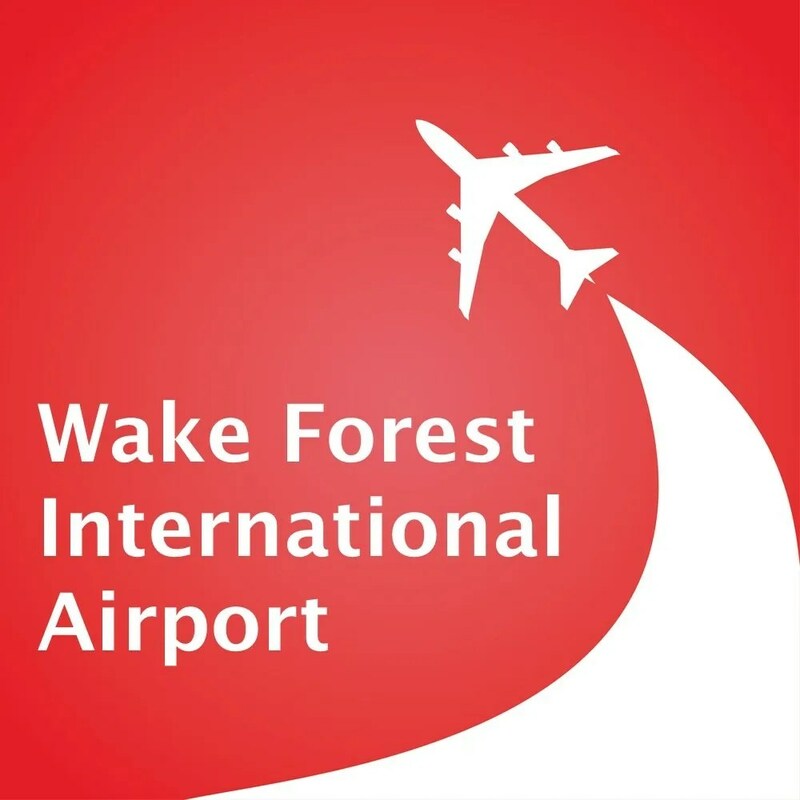 Exploratory committees have been examining the need for a second international airport in the area and the Flying Association Regional Transportation Study (FARTS) team has identified a final location for the new airport to be known as Wake Forest International Airport. The airport has already been assigned its official FAA identifier and will be known as WTF. The FARTS team study was underwritten by a WIFF, (Wake International Flying Foundation) effort to secure the most likely land available for the new airport. 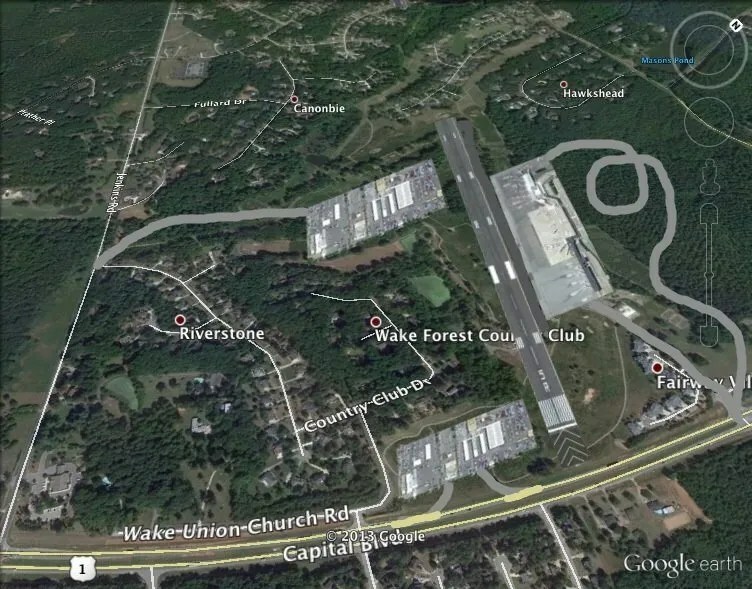 Thanks to a non-sustainable grant from the Federal Aviation Administration the land formally known as the Wake Forest Country Club and Golf Course was purchased to use for the new location of the international airport. The land was sitting idle and it’s proximity to transportation and location made it ideal. You can see the final WTF design approved by Wake County and the Federal Aviation Administration. The study concluded that hardly any local impact will be felt. Aerial view of new Wake Forest International Airport (WTF) design. This drawing cost the State of North Carolina $400,000. This property is strategically located along U.S. Route 1, a major route from I-85 down into Raleigh. This route should provide easy access for local residents from as far away as Henderson and that weirdly named town, Norlina. The airport will backup to the Riverstone community which should make it a wonderful addition for residents and do something to property values. Hey, the golf course pulled out, beggars can’t be choosers. Fairway, runway, it’s about the same thing. And those that live in the Fairway Villas will have a front row seat to watch all traffic coming in and out of the new terminal as well as landings. Bonus. Developers plan to rename Fairway Villas to Runway Villas to double the resale value. The close proximity of the approach end of runway 5 will also provide an unexpected visitor draw, much like that experienced at the St. Maarten airport. It is estimated that landing aircraft will pass as low as 50 feet over U.S. Route 1 on approach. Visitors to the area, who want to get blown by landing aircraft, are expected to spend time visiting local merchants and leave their money behind. Footage of the fun visitors have had at the approach end of the St. Maarten runway and what is anticipated here with the opening of WTF. 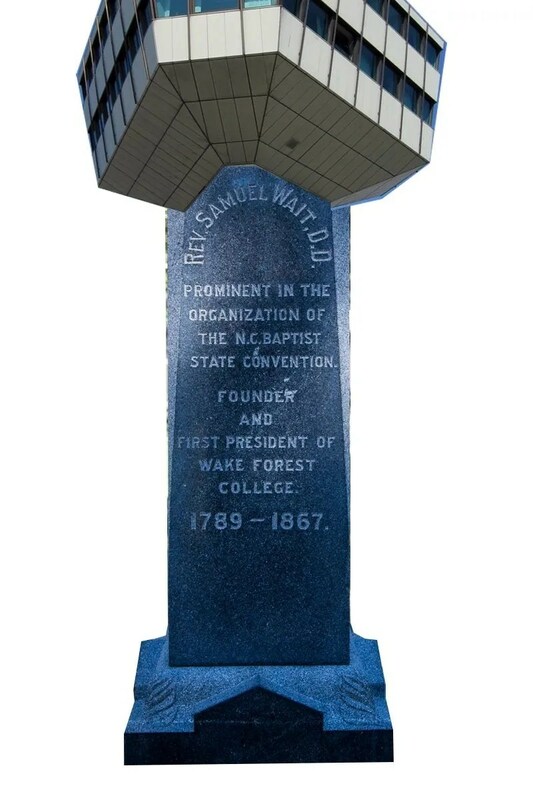 In honor of our strong Wake Forest heritage the new terminal will be named after an influential figure in Wake Forest history, Reverend Samuel Wait. Dr. Wait was the founder and first President of Wake Forest College, for whom Wait Avenue is named. He will be the lucky namesake. The prevailing thinking was Dr. Wait deserved something good to happen for him considering he was buried in the Wake Forest Cemetery when the college was in town but the college bugged out on him and left him behind. Bet he didn’t see that coming. Terminal 1, will be known as the Wait for International Travel terminal and will be called “Wait for IT” for short, due to OSHA sign length limitations. Mockup of Wait Control Tower based on feedback from WIFF. To further celebrate Dr. Wait the new tower at the field will be constructed using his headstone in the Wake Forest Cemetery as a guideline. After much consideration the WTF committee charged with the new tower design decided a strict interpretation of the original headstone as the tower base would be the best way to honor Wait. That and it was a whole lot cheaper than reinventing the wheel. They found no obvious ways to improve on that design since it is already a perfect tower design. You certainly can’t argue with that logic. Johnny John Johnson, the local resident, constantly maligned as a lad for perceived stuttering during roll, served faithfully on the WIFF team. Initial routes WTF will service. Routes will expand as needed and heavy traffic is expected considering the otherwise long drive to Raleigh Durham airport. At the same time as the new airport opens, a new local airline will take flight. The local seminary has decided to take on that challenge. It makes sense we guess, especially with all the missionary positions they are responsible for filling. While we were not in favor of the name, the seminary insisted that the airline be rooted in their core mission and purpose. By a near unanimous vote they decided to name their airline Semin Air since it is so close to the word ‘seminary’ which is a stupid reason. Unable to convince them otherwise Semin Air has already developed their new logo and color scheme, which you can see below. Semin Air, yep it’s still a horrible, horrible name, will take possession of an aged fleet of two Boeing 737s at WTF that have been specially outfitted to turn any bird they may strike to a puddle of wine. Only problem is it is Boone’s Farm Blue Hawaiian wine. 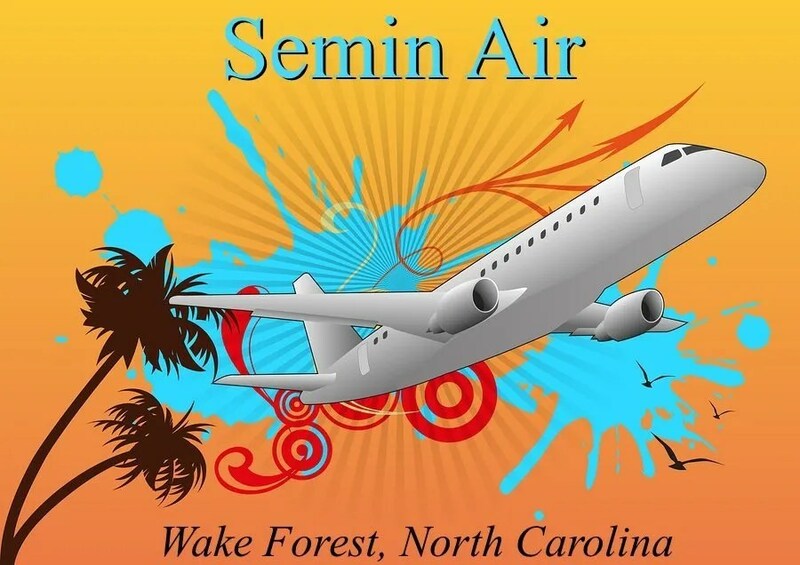 Semin Air will be headquartered in Wake Forest, North Carolina and intends to supply fresh missionaries to hungry canibal tribes around the world. Local residents will be encouraged to rent out space in their driveway for extended stay parking. Airport General Manager Mary Margaret Muckenfuss said, “So we forgot to plan extended stay parking lots. Big f****ing deal. We’re not perfect. Our bad. To help offset the initial investment in the airport and facility construction costs the plan is to use the airport extensively at night to fly freight in and out of the Raleigh Area via WTF. Both Federal Express and UPS plan to base really loud Boeing 737s out of the airport. They plan to only fly between 1 am and 5 am. 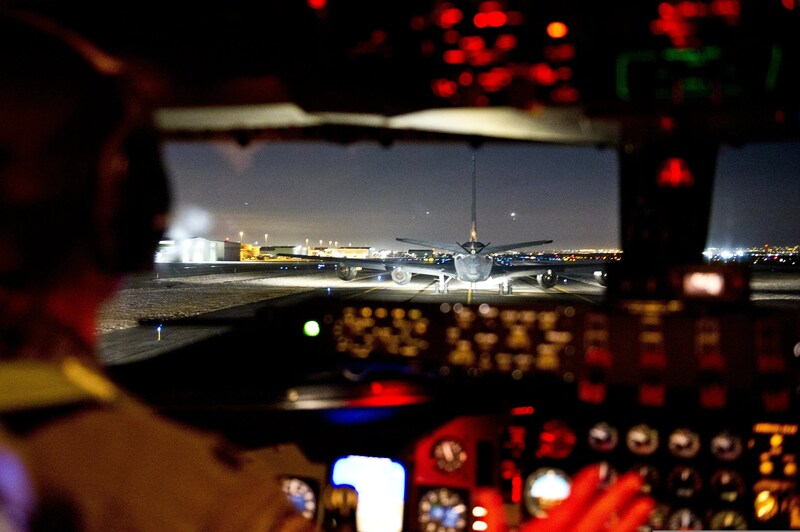 UPS planes get ready to take flight at night in Wake Forest. At first the neighbors living off the end of the runway will be disturbed by the heavy freight traffic but soon they will adjust or be so sleep deprived they will be passed out. The Federal Aviation Administration is looking forward to the opening of the new airport and plans to use it to launch the nations first flying car initiative. The Car Responsive Aerial Personal Service program (CRAPS) will allow ride sharing for those wanting to use their personal flying cars for carpooling. The flying CRAPS program is destined to make an impact. However, the official study document was not exactly clear what type of impact was desired. Hopefully the picture of the crater in the report does not portend the anticipated outcome. The new construction and staffing of WTF will create new local job opportunities. Area hunters are encouraged to start applying now for part time positions that will allow them to dash to work from hunting and give them a chance to wear their hunting gear at work, reducing their need for a specialized wardrobe. Deer hunter Ashboro “Tiny” Elmwood is finishing his training to marshall aircraft at the new WTF. Here he is making an X with some orange sticks at $41.50 an hour. 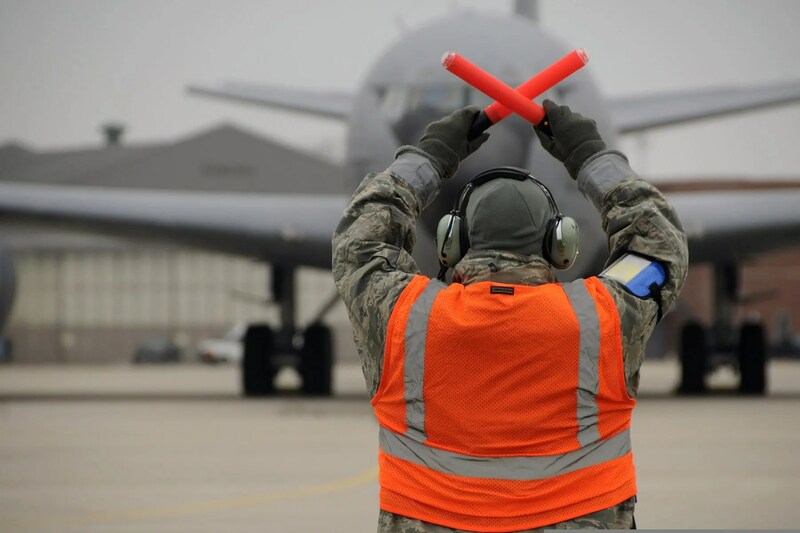 When asked about the training he’s received for his new part time job of directing aircraft on the ramp, Elmwood said, “My instruction has been thorough and professional. However I have to admit at my age, studying for the exams was tougher than I expected. Training for international pilots has already begun but apparently not all simulated approaches have been flawless. Here is previously classified video of one German pilot being called a retard right before touching down. Frankly, that seemed a little politically insensitive to call the female pilot a retard three times, but what do we know. 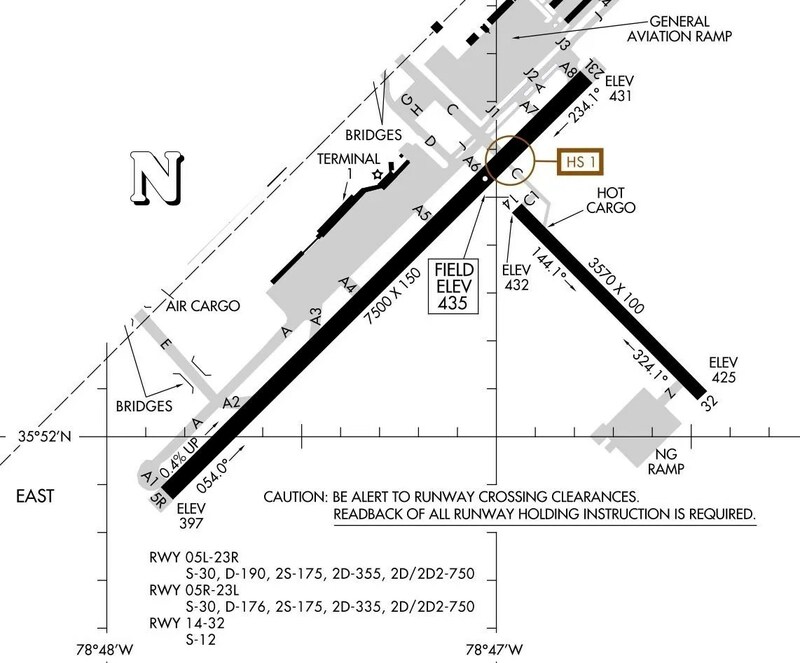 Initial FAA Approach plates issued for WTF show a presumed future runway that would extended over the current pond in the area. 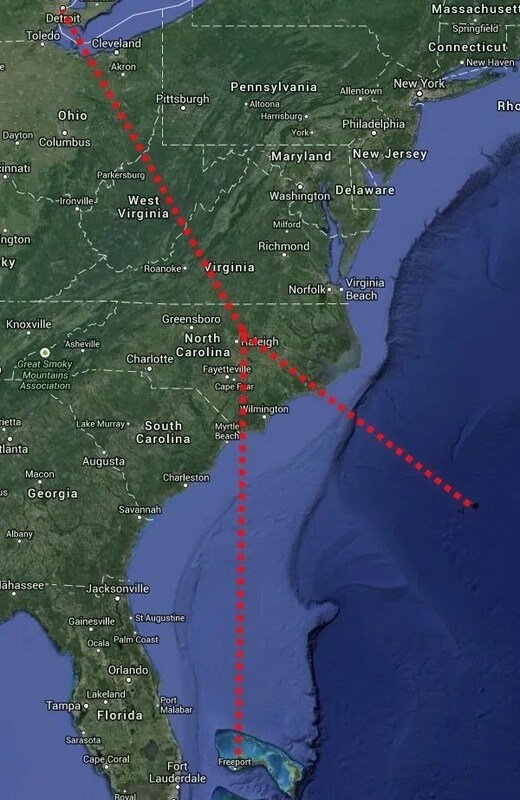 An anonymous insider, who gave us permission to use their name but we forget to write it down so they wound up anonymous, said the FAA has already issued practice approach plates which show the existence of a potential future runway that would extend into nearby neighborhoods. Presumably this is based on the FAA big push of the CRAPS program. The additional runway would make it easier to participate in taking a flying CRAP without departure delays on the primary runway. The airport food committee would also like anyone with experience working at Starbucks or Cinnabon to step forward and be ready to take on management rolls at the new facility. Residents of Rolesville will be given second preference after Wake Forest residents, for openings since their town already sounds like roll. Folks from Bunn will have third priority. Folks from Franklinton will just continued to be ignored. Good news is there was no need to build a fuel facility on the airport. Both Cruizers and Sheetz will be installing Jet A fuel pumps with really long hoses to service aircraft. Airport fire service will be provided by our own Wake Forest Fire Department and security by the Wake Forest Police Department. We wanted to memorialize the location of the airport prior to the start of construction. These photos will give you an idea where the runway will be built in relation to the current structures and landscape. View down future position of runway 5 Right from about the mid-runway position. The final runway will be about 7,000 feet long. View on future position of 5 Right looking back towards approach end. You can see the existing Fairway Villa homes will have a spectacular view of landing flights. Old Wake Forest Country Club building will serve as temporary terminal. View from approach end of runway 5 Right from U.S. Route 1, Capital Blvd. Being sensitive to the concerns of local residents, anyone who thinks the new airport should not be built is strongly encouraged to contact Wake Forest Today, the areas first daily digital newspaper (beat us by two weeks), and express their outright disgust and outrage. You can click here for contact information so you can submit your complaint. Originally published on November 5, 2013. I hope you are kidding. But nothing surprises me anymore. Please tell me that you guys thought of FARTS (Flying Association Regional Transportation Study) and the whole article spawned out of that idea. I'm not sure what I just read, but whatever it was, it was absolutely hilarious! so much tongue, so little cheek, they said it couldn't be done and you did it anyway. this deserves some kind [idk what] of a reward, or something. thanks for the great big belly laughs that could be heard as I read this aloud to my husband! So funny! Thundermots Airlines never really took off either! It was the fastest way to get to Five Flags Over Fuquay! You old timers from the Triangle will know what I am talking about! TEEHEEHEE!